Good morning, chic readers! We’re heading to NYC today (Hooray! ), so this seemed like a fun day to focus on a New York designer–with plenty of good taste. Andrew Flesher Interior Design truly creates homes that meet its owners’ needs, no matter the location or the style. These designers understand that, sometimes, the little things are the big things–like this fun twist on an old favorite chair. We’re huge fans of all these designers’ spaces. Not surprisingly, they do the outdoors just as well as they do the indoors. We can’t think of a better place to spend an evening, no matter the season. Thanks so much for making Design Chic a part of your day. We hope you enjoyed the good taste of Andrew Flesher Interior Design as much as we did! Molly Sims Pacific Palisades Home and More! It’s a little dreary and gray around here today, so we’re feeling like taking a trip to LA, where it’s sunny and bright! Fashion stylist Jessica de Ruiter and her husband, artist-designer Jed Lind, are too kind to welcome us into their fabulous modern LA home via One Kings Lane. This chic interior is modern living at its best. Unconventional windows offer plenty of light to make the indoors feel sunny and bright. 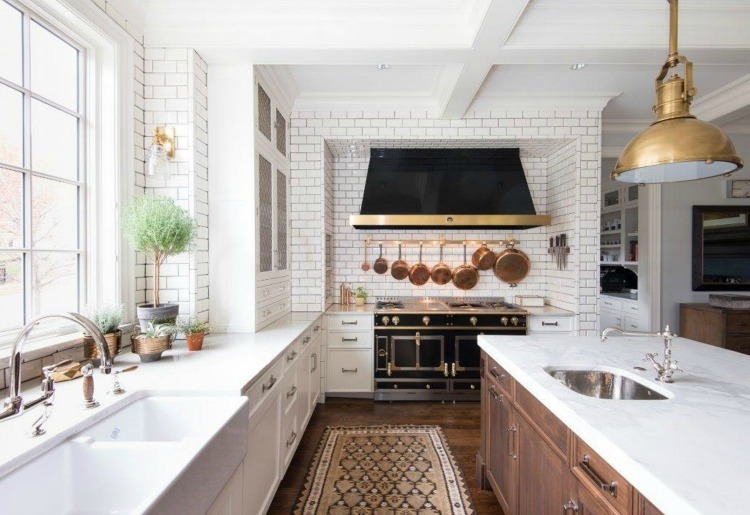 A sleek and minimalist kitchen incorporates luxe details to lend a calming yet stylish atmosphere. Open shelving displays daily necessities right at arm’s length. Earthy and simple dishware like this always looks organized and is in perfect keeping with the tone of the house. Gallery walls are always a favorite touch of ours. But who says they have to be symmetrical? We adore gallery walls like this one that are full of special trinkets with meaning. A gorgeous office is always great. A gorgeous office with a view is even better! Comfortable and earthy, this bedroom blends seamlessly with the outdoors. The blend of textures in this fabulous bathroom adds so much interest in dimension. A little girl’s bedroom doesn’t have to be pink and full of princesses. This one offers tons of space for an imagination to grow. Speaking of imagination, this play area is perfect! Books, art and costumes… What else could a child possibly need? We adore this precious playroom! From top to bottom, kids’ spaces to adults’, this modern LA home is nothing short of totally chic. What do you think? Are you a fan of modern living? The more we see, the more convinced we are that paring down, keeping it simple and coming back to those clean lines is the way to go. With the busyness of everyone’s lives today, the mental clutter and chatter that tends to take over, coming home to something sparse and streamlined is almost a necessity. When it comes to getting back to those basic values, Brady Design is tops. They manage to create rooms that feel at once open, airy and perfectly chic. Every detail is perfectly choreographed so that each space feels like a place we couldn’t wait to come home to. From kitchens that wow to living rooms that stun to master bedrooms that would put us to sleep in the best possible way, one look and you’ll see why we think Brady Design is in good taste.